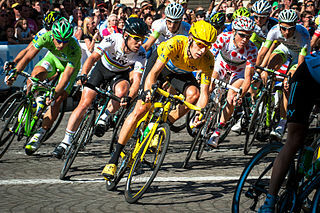 Bradley Wiggins, a 32 year-old from the United Kingdom, won the Tour de France on July 22. The Tour de France is considered to be the world’s biggest cycling race and also one of the toughest sports challenges on Earth! The Tour was a 3 week event where the cyclists covered a total distance of 3,497 km (2,172 mi) – that is about the distance between Madrid (Spain) and Moscow (Russia). It took Wiggins 87 hours, 34 minutes, and 47 seconds of cycling to complete the race, and he won by a margin of 3 minutes and 21 seconds. This year’s race had 22 teams with nine cyclists in each. The Tour de France is held every year in July in France. The race goes all around France and often passes through some of its neighboring countries. This year it also passed through Belgium and Switzerland. The route of the race changes every year, but it always ends in Paris on the Champs-Elysées, one of the most famous streets in the world. Each day of the bike race (called a stage of the race) is roughly equivalent to running a marathon, in terms of effort. Now imagine running a marathon each day for three straight weeks! On a typical day, each biker needs to eat or drink about 10,000 calories (most of us need just 2,000). There are many different awards given during each stage of the race, but the main award is for the person who has the overall least time during the race. That winner gets to wear the yellow jersey (a yellow colored biking shirt). The fastest sprinter wears the green jersey, the best climber wears a red polka dot jersey, and the fastest young rider (under 25) wears the white jersey. Now who do you think came up with the idea of starting such a race? Some serious bikers, perhaps? Not quite. The race was started by a magazine company in 1903 with the hopes of increasing its circulation. One person’s absence was felt at this year’s Tour de France and that is of Didi Senft. 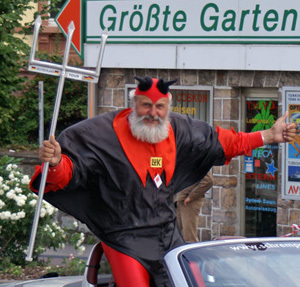 Senft, a German bike inventor who is also known as “El Diablo”, has come and watched the Tour de France every year since 1993. He dresses in a red devil costume and runs alongside many riders. Senft missed this year’s race due to health issues. He has invented many unusual bikes including one of the world’s largest bicycles. The closest win ever in the Tour de France was by a margin of eight seconds in 1989 by Greg LeMond, an American cyclist. Can you imagine cycling with every little bit of strength in your body for 3 weeks and then losing by just 8 seconds? !